This is Ned, a Senior Thai student in our school. I told her during my class with her that when the schedule of the next challenge would be posted, which was 2 hours before I dismissed her, I would look for her if I could fit her for the challenge. YELLOW showed up. These golden showers are all over the school now. But she was in our school uniform. I had some yellow cloth I used during the last Yellow challenge so we used it as her top. And the rest was....imagination. Her friend, BTW, had to hold up the flowers because we had this in the middle of the school's corridor. :) I was lucky to have a free block along with Ned. I am quite sure this will earn me at least a 6. Good enough for the TEAM NIKON. Too bad this one didn't end up higher. Really like it. Gorgeous. I imagine this will score quite high. 10. I always find that people with longer faces are more difficult to shoot then the nice round ones. Good portrait, a touch of Librodo. The contrast is striking, can't help feeling the flowers too dark, they become black on the edges..
Lovely model. 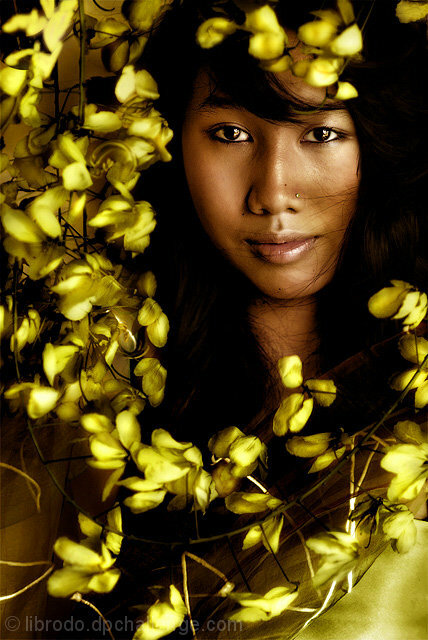 Nice contrasts with the color of the flowers and the model's skin and hair. Interesting movement in the flower/vines but it seems a bit neatimage-y to me. Lighting is good as is composition. Feels a bit familiar and thus static in general though. 6. Proudly hosted by Sargasso Networks. Current Server Time: 04/19/2019 01:07:09 PM EDT.